In this panel the participants discussed changing audiences. There is a shift from an audience that consumes to an audience that engages, whether through Twitter, Facebook, Tumblr or YouTube. The audience is connected to the creations they love and, more and more importantly, to each other. Social TV is becoming more and more important. A TV magazine like TV Guide from Christina Tanner turned into a streaming and information website about TV with predictions and recommandations around TV, and the Watchlist is very accurate. Even Hollywood discovered the need of Social Media and Eric Kuhn became Hollywood's first Social Media agent at United Talent Agency. 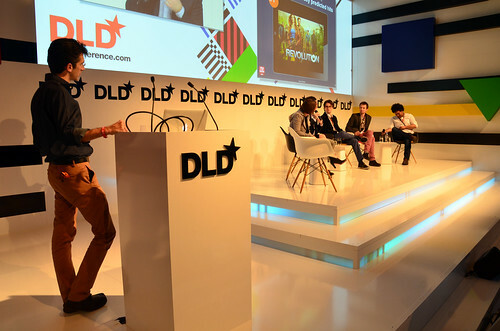 Kenyatta Cheese took the DLD audience on a deeper level of Dr. Who, a famous British sci-fi series. He developed a fan community for Dr. Who where people are able to do e.g. amazing fan art work or music. Fans create mass amounts of art and posts from each show in realtime. The tumblr doctorwho.tumblr.com curate a lot of it. Analyzing the insights shown by Kenyatta verified the real time usage of social media during every episode. But this is only TV 2.0, Josh Weinstein argumented. His platform YouareTV will be TV 3.0 where the audience can video dial-in, a better engagement with the audience and between audience, media and celebrities might occur. TV and Social Media are melting together.